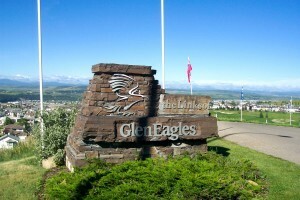 GlenEagles is a quiet hillside community just east of the town of Cochrane, boasting over 950 homes. The subdivision consists of seven pods, two residential communities (GlenEagles East and West), and five bareland condominium complexes (the Villas, the Estates, GlenHaven, GlenVista and GlenSummit). Besides having the Links of GlenEagles Golf Course winding its way through the subdivision, GlenEagles is blessed with 13 acres of green space. Nine acres in four Parks (Murphy Brothers, Fenton, Wearmouth and View) and four acres of boulevards and green spaces. Playground equipment is placed in three of the four parks in the subdivision for children to run and play safely. Parks with benches and natural sandstone rocks are available to enjoy the views and watch nature at its best. GlenEagles offers acres of walking and bicycle paths meandering throughout the community, into downtown Cochrane and into bordering Glenbow Ranch Provincial Park. Whether it’s a heart pounding running workout or an easy stroll taking in the scenery, you will find it outside your door. GlenEagles is west of Calgary city limits on Highway 1A, located at the east end of the Town of Cochrane. Downtown Calgary is only a 30 minute drive away. west by the rest of Cochrane and substantially enclosed on the South and east by the Glenbow Ranch Provincial Park (GRPP). The Condominiums (brown) and GlenEagles East and West are interconnected by pathways.